Mohamed Salah scored from the penalty spot as Liverpool steadied their title-chasing nerves with a 1-0 win at Brighton in the Premier League on Saturday. Salah struck his 14th league goal of the season to put Liverpool seven points ahead of second-placed Manchester City, who host Wolves on Monday. Liverpool went into the game with back-to-back defeats but were in professional mood. Jurgen Klopp's men laboured throughout, unable to generate anything like their trademark attacking zeal against Brighton, but still had enough to claim all three points with a goal from Salah. Willian's sublime strike earned Chelsea a 2-1 victory over spirited Newcastle at Stamford Bridge. Pedro's ninth-minute lob saw the Magpies trailing, but Ciaran Clark headed in a deserved equaliser before half-time. The Blues had plenty of chances, but only prevailed when Willian curled in a decisive second, following another assist by Eden Hazard, who was again deployed as Chelsea's 'false nine'. Goalscoring remains an issue for Chelsea, who faced the prospect of a third top-flight home game without scoring for the first time since November 1993, but finished the day with a six-point advantage over fifth-placed Arsenal, who lost 1-0 at West Ham. Declan Rice scored his first career goal to fire West Ham to victory. Burnley recorded a fourth straight win in all competitions despite not having a shot on target as they came from behind to beat Fulham 2-1 courtesy of a pair of own goals at Turf Moor. Andre Schurrle fired Fulham ahead just two minutes in with a stunning strike which crashed in off the underside of the crossbar. But, just after Chris Wood had struck a post for the hosts, they were level in the 20th minute when Jeff Hendrick's shot deflected off Joe Bryan to find the net. And three minutes later they were ahead as another Hendrick shot this time deflected off Denis Odoi to beat Sergio Rico. 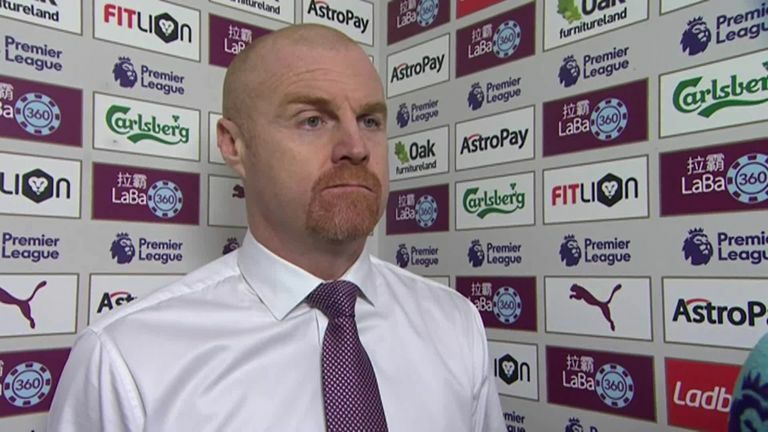 Burnley manager Sean Dyche says James Tarkowski's defending won them the game as they beat Fulham 2-1 at Turf Moor. Watford struck a post twice in the opening five minutes against Crystal Palace and their failure to score looked like costing them dear seven minutes before the break when a goalmouth scramble ended with a Craig Cathcart own goal. But Cathcart made amends in the 67th minute when he scored at the other end to level and seven minutes later Tom Cleverley smashed a loose ball into the top corner to set Watford on their way to a 2-1 victory. Southampton climbed out of the drop zone as they hung on for a 2-1 away win at Leicester. 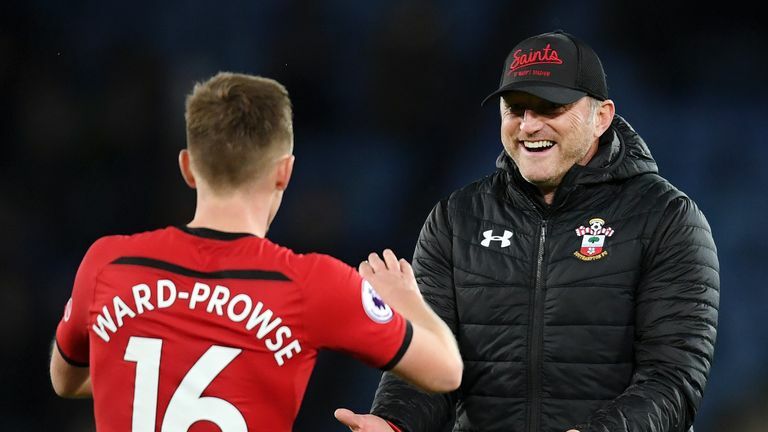 James Ward-Prowse put the Saints ahead from the penalty spot in the 11th minute after Shane Long was brought down by Nampalys Mendy. The Foxes were handed a lifeline when Southampton defender Yan Valery was sent off shortly before the break, collecting his second yellow card after jumping in on Mark Albrighton. But in first-half stoppage time Long made it 2-0 to Saints after pressuring Mendy and firing beyond Kasper Schmeichel. Wilfried Ndidi got Leicester back in it just before the hour mark, bundling home from close range, but Southampton saw the game out. It finished goalless between Cardiff and Huddersfield, with Huddersfield angered late on when referee Lee Mason initially awarded a penalty for a foul on Florent Hadergjonaj, only to change his mind after talking to his assistant.